"You are the living embodiment of white privilege. You have no business on this panel with us, but you're here because of your privilege." The producers of "The Daily Blast Live" do not want viewers to see this clip of host Al Jackson berating fellow co-host Beau Davidson for being a white male. 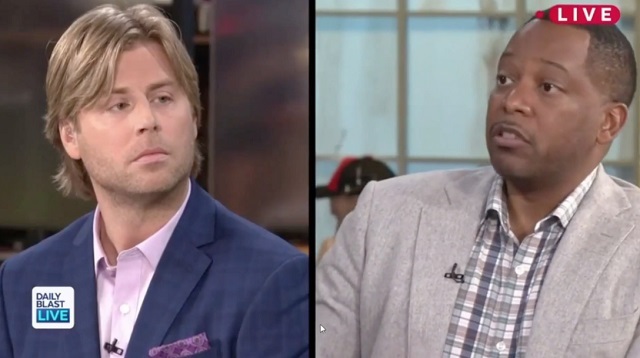 Co-hosts on the set of The Daily Blast Live exchanged heated semi-friendly fire Wednesday in a brutally personal debate over white privilege, following the publication of a racially-charged caricature of Serena Williams. Jackson went on to say how oppressed he was because he watched "racist cartoons" as a child. Jackson's freak-out continued with him telling Davidson: "I don't want to talk to you because I don't want to normalize you and your hate speech. Me working with you will be the biggest regret of my career." The Daily Blast Live went around filing DMCA takedown notices against everyone who shared the newsworthy clip.